Our first participation in this years WSOP started with a cannonball – when we arrived at 9 AM to buy me into the days $1500 NLHE event #2 starting at noon we got informed that the event is sold out! Sold out??? What the hell…. I could’nt believe it! I walked down the hall, steaming. Ok, deep breath. Katja was suposed to play the event, Pokerstars already bought her in, did’nt they? So, we went to the “Will Call” counter and asked to pick up her receipt. Picture ID needed! Picture ID? Katja had none on her (she thought registering with her passport the day before was good enough). Ok, so Katja went back to the hotel to pick up her ID and I went to the satellite area. When Katja was gone I went to the emtpy cashier area and tried to buyme in, regardless of what they said at the entrance. The very kind cashier man informed me that the event is sold out and we talked a few minutes. He told me that the event is sold out since the day before, 6 PM. Incredible. They not only sold 2200 tickets, the also sold the absolute maximum number of alternates (players that only start to play when annother player has already busted out) of about 500 for the daily maximum of 2,750 players! What a start into this years WSOP. Then I went to the satellite area and played a $225 satellite. At first I was doing well when I picked AQs under the gun, made it 500 to go (big blind 150) and got called by the button who had about the same chips like me. Flop came A45 rainbow and made a pot-sized bet. Button re-raised all-in and I called. I showed my hand, he nodded and said “draw”. Draw??? He showed 63s. Wow. Before I could really get shocked by his play the dealer turned a 2 and he made his straight. The river brought another -meaningless- ace and I was done. They announced the last satellite of the day I I jumped into it, taking the last seat ($175 for 3 lamers). Meanwhile Katja arrived and I saw on her face that something was not ok. Yes, when she tried to pick up her receipt for the days event none was there. Something went wrong. Sharon from Pokerstars was on her way but we already knew that there was no real chance to do something as the event was sold out to the maximum. So both Katja and I were at the Pokerstars booth when the event started, joined by Vanessa Rousso and online poker pro “Twin Caracas” (both very nice people). Both had the same problem, something went wrong with the buyin. Finally, Sharon arrived. I wont go into details here but they were just small processing problems. Sharon apologized and offered to buy Vanessa and Katja into all events they planned to play. Well, nobody needs to say this two times to us and we went straight to the cashier. About an hour later all was done, Katja holding her paid entries to a lot of events now personally. We went o the Forum Shoppes after that, searching for some nice clothes were Pokerstars can put thir logo on (Katja was looking for “Juicy Cotoure” or something like that). Wow shopping can be a pest! We got very nice japanese food in the Shushi restaurant there. Hours later we arrived at the Mirage where I jumped into a 20/40 game, winning >$700 in 30 minutes. Back to the room, taking a nap of about 2 hours. Back to the Rio’s, playing some satellites again. Katja played 3 satellites of $175 each but had no chance. I played two for $325 each. Good hands got cracked so I was out in 4th and 3rd position, winning nothing. 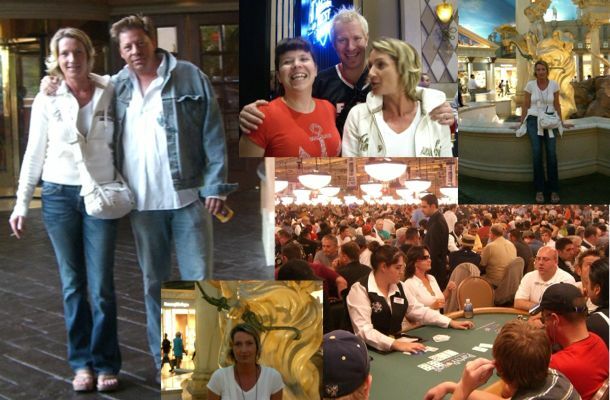 I then had enough and tried the cash games at the Rio, joining a 20/40 game. First I was down about 500 when I lost a set (66 on a KJ6-A-3 board, opponent had AA) but quickly got on a rush, winning 5 biiiiig pots in row. I quited a +$1300 winning session (which just covered the satellite costs). We went to look at the days tournament, 170 players left including our friend Casey Kastle (all in the money). Greg Raymer was sitting on what looked like a big stack. Final standings for the day here.